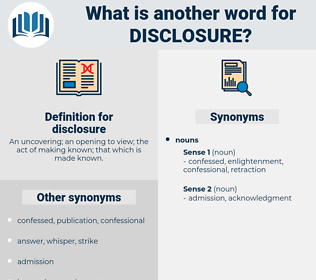 What is another word for disclosure? communicators, enquiries, media, Inquiries, servants, data, disclose, disclosing. radiocommunications, briefings, breaches, submissions, Bodies, communicators, media, data. 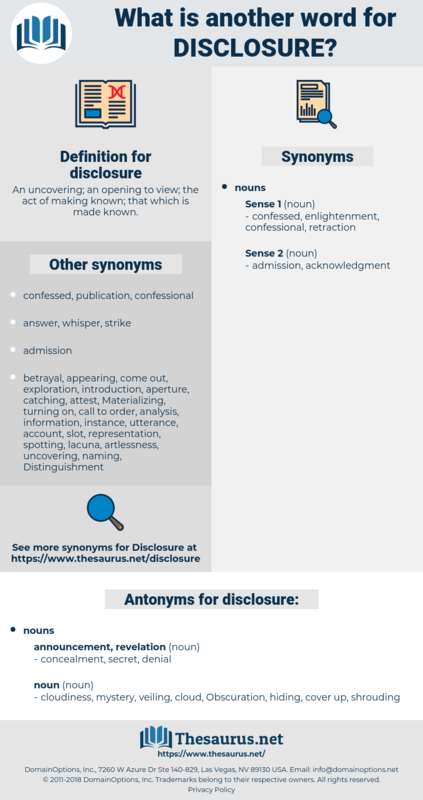 data, Whistleblowing, disclose, disclosing, issuance, information-sharing, publicizing, appropriation, eye-opener, epiphany, leakage, description. cloudiness, mystery, veiling, cloud, Obscuration, hiding, cover up, shrouding. He will understand the far - reaching disturbance that must result from the disclosure of the truth of this affair. Her disclosure would appear but the last resort of malice and receive little credence. display, leak, informing, news leak, discovery, divulgement, tattle, singing, ratting, exposure, divulgence, telling, giveaway.